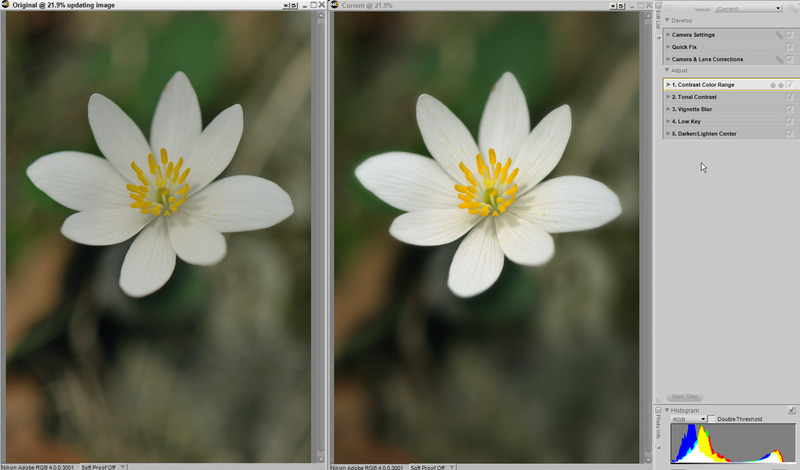 A short while ago I posted an article on Wildflower Photography Basics. I was out yesterday when the wind was strong enough at times to tip a tripod. What can you do to make a sharp image when the flower is dancing all over the place (was this what inspired Tchaikovsky’s Dance of the Flowers ;-))? It can be done. Here’s an example from yesterday’s outing. 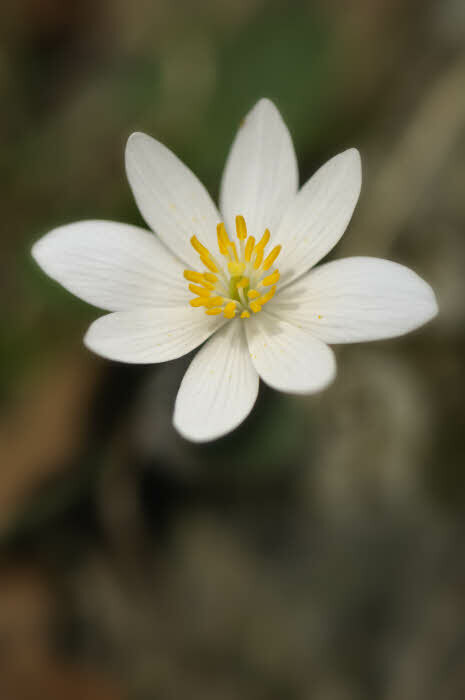 Bloodroot, Shenandoah National Park near Big Meadows. One of the earliest spring wildflowers. I mentioned making a “sharp” image. The example above meets my criteria – even though the background is blurred. For me, floral images DEMAND soft backgrounds. I’m trying to show you the flower and not whatever is behind (or in this case 6″ below) it. My desire for a soft background coupled with a need for a very fast shutter speed (to cope with the “Tchaikovsky effect”) worked together. Both require a open aperture. The open aperture, together with ISO400 (D300’s normal is 200), got me a shutter speed of 1/3200 sec which is plenty fast to freeze the motion of this flower. ISO400 was overkill. Maintaining focus (the flower was moving toward/away from the camera slightly – not just sideways). The shallow DOF meant that not only was it moving in/out of the frame but it was also moving in/out of focus (manual focus for reasons discussed the the earlier post). Solution – Switch to your camera’s highest frame rate (about 6 frames per second in my case), wait for a lull (still moving but mostly within the frame), and fire off a burst of 5-10 shots. Do this a couple of times. Note – The alternative of moving the camera to follow the flower will not work here. Following the above guidelines will almost guarantee you at least one keeper. Hand held shooting here is problematical. Forget shooting wide open because the shallow DOF will beat you every time. 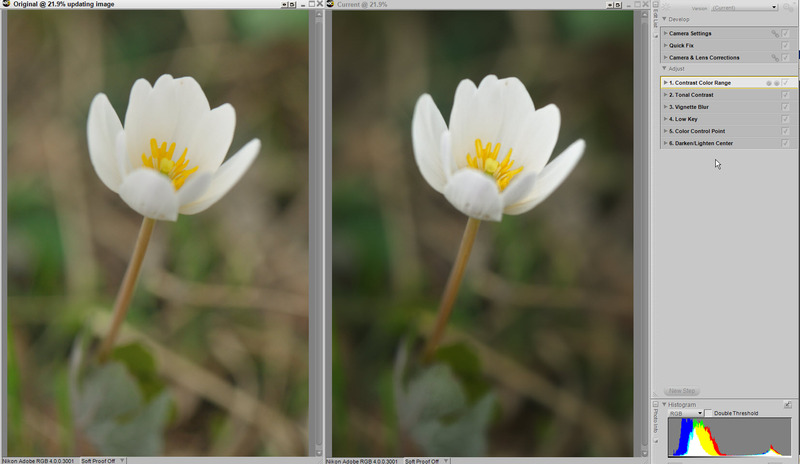 OK – stop down the lens a bit to increase DOF. Oops! now the shutter speed is getting too long (and that darn background is getting distracting). 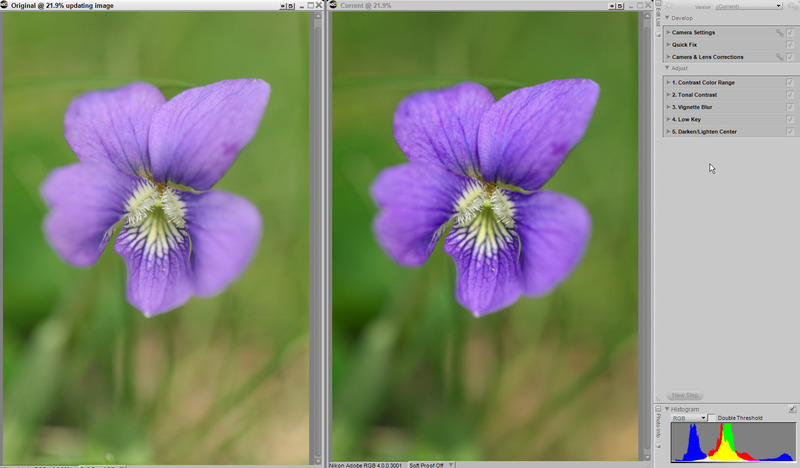 Even without the wind problem, this describes why hand held floral shots usually aren’t very good (good measured by the subject being sharp while the background is soft) – you can’t maintain focus where the focus is needed with a DOF on the order of 1/8″ or less. You just can not – and the multitudes who think otherwise are kidding themselves. 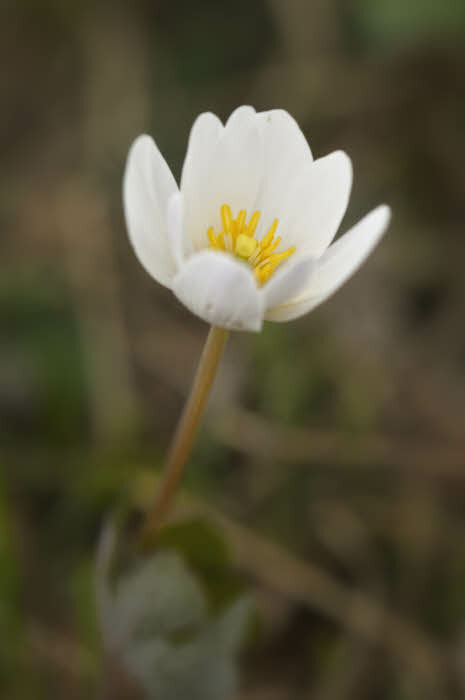 Here’s another example – much the same as above with a bloodroot that was only partially open and with the camera almost level with the flower. Since I want the focus (camera and viewer) on the flower, in this and the previous post I’ve discussed reasons and ways to deal with the background when capturing the image in-camera. However, we can do even more in post processing if we want. The viewer’s eye is drawn first to brightness coupled with contrast. The contrast can be tonal (e.g. white against black) or color such as a lone yellow aspen in the midst of a mountain side of pines. We can use post processing to capture the viewer’s eye using the above information by increasing color and tonal contrast in the area where we want the viewer to look. We can go even further by doing just the opposite to areas that we want to play down (like the background). The opposite would mean doing things like darkening colors (not brightening) and blurring (not sharpening). I’ll illustrate this with four wildflowers from yesterday. These are examples of what I call “cropping with light”. 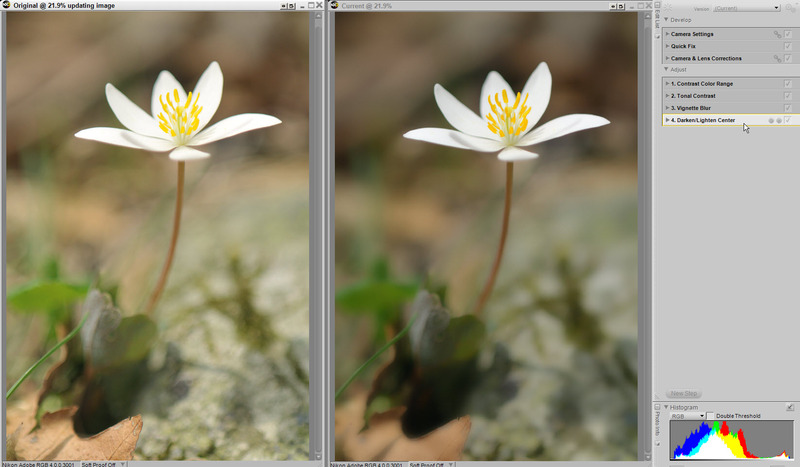 I have played with just the light (brightening/darkening) and the contrast (sharpen/blur). Not one pixel was cropped from these images after they left the camera, but I contend that the effect is greater than if the background had been cropped out. You can see that #1 is to help with the subject (i.e. capture the viewer’s eye). #2-#4 all deal with the background or, more specifically, they all help separate the subject from the background (cropping with light – the background has been cropped “virtually” by reducing its impact/distractions). Also note the histogram in the lower right of each screen capture. It’s filled from left to right without “climbing the side walls” – a sign of a well exposed high contrast image (low contrast would be a narrow graph that fills less than half of the histogram space from left to right). This entry was posted in Craftsmanship, Exposure, Focus, How did you make that image?, Motion, Post-Processing and tagged Color Efex Pro, Digital Workflow, NX2, Outdoor Photography, Photography, Photography Composition, Photography How To, Photography Technique, Photography Tutorial, Photoshop, Post processing by Ed Knepley. Bookmark the permalink.